It’s no secret that modern shoppers are visiting your WordPress website, reading your content, signing up for your services, and purchasing your products from a variety of technological devices including desktop and laptop computers, smartphones, and tablets. That’s why it’s crucial your WordPress website’s theme has a responsive design — so your website visitors can easily browse your site while having an equally pleasant experience from any technological device. Responsive WordPress themes automatically change their layout and format based on the size and resolution of the screen in which they’re being viewed. This ensures a positive user experience and seamless transition for your website visitors while they move from desktop to mobile to tablet. With such an abundance of WordPress themes available, finding your responsive theme of choice may be a difficult task. That’s why we’ve put together this list of 15 of our favorite themes for 2019 that you can review and consider for your own website. Below, you’ll find feature descriptions for all 15 options as well as a few key takeaways for those of you who are looking to find a theme as efficiently as possible. Avada is a responsive, multi-purpose WordPress theme with versatile features and layout options fit for business, creative, e-commerce, and more. With no coding required and a minimalist design, the theme is easy to use no matter your level of web development knowledge. The theme also allows you to disable responsiveness if you create or add something to your site that is only meant to be viewed on one type of device. If you’re looking for a responsive, multi-purpose WordPress theme, BeTheme might be a good option for you. BeTheme is also considered a lightweight theme, meaning it’s efficient, quick, and takes up minimal space on your server. With over 390 pre-built websites, you can get started adding your content with just one click. The responsive design allows you to choose minimal headers and other features to fit on smaller screens, so your visitors aren’t overwhelmed by the amount of content they’re viewing in such a tight space. 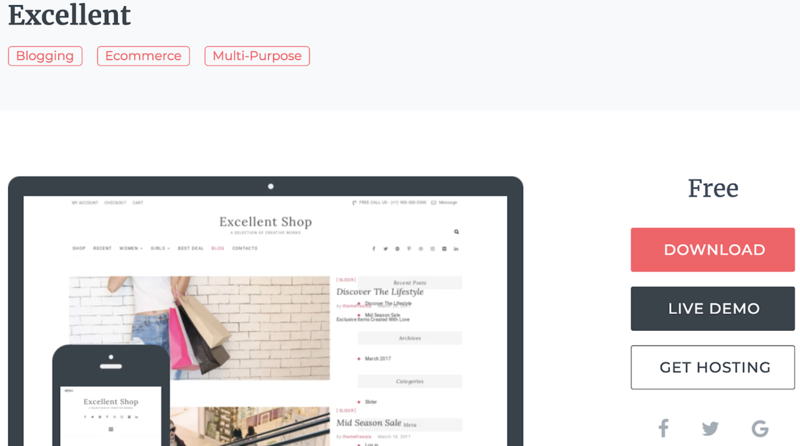 Jupiter is a responsive, multi-purpose theme with a visual page builder that allows you to update and review the changes you make to your content and website in real-time. The theme has WooCommerce integration so you can easily set up and manage your online store straight from your WordPress website. Jupiter is also SEO-ready to help your website rank organically for specific keywords and phrases. Flatsome is a responsive and multi-purpose WordPress theme with WooCommerce integration for e-commerce businesses. The theme has a custom product page builder so you can easily display and sell your items in a way that makes sense for your business. Flatsome is already translated in more than 12 different languages for those of you looking to sell your products in other countries. Impreza is a responsive, multi-purpose WordPress theme that offers a number of unique, ready-to-use demos to help you start customizing your website. With Impreza, all of your theme updates are automatic so you’ll never have to worry about managing your own software. Float is a responsive, simple WordPress theme tailored to e-commerce websites. The theme offers a clean, minimalist design to improve user experience and ease-of-use. The two product page display options — scroll and slider — allow your customers to either scroll up and down or slide right and left to view your products. One Page is a single-page WordPress theme, meaning it displays all of your most important website features on your homepage. This might be appealing if you don’t have a ton of content on your website and want to keep it all in one location to improve user experience and efficiency for your visitors. The theme only allows space for your most important business-related information to be listed on your homepage making it minimalist and clutter-free. Excellent is a responsive, multi-purpose WordPress theme focused on businesses and e-commerce sites. With a variety of different sections that you can add and move to suit your business’ needs, as well as a wide range of navigation menu options, there are hundreds of ways to customize your company’s website. The theme’s WooCommerce integration allows you to simplify the management of your online store and gives you the ability to add sidebars with links to all of your social profiles so your customers can easily view and follow your accounts. Mustache is a responsive, creative WordPress theme built for sharing artistic work and written content as well as portfolios and presentations. With Mustache, you can easily add the Google Analytics integration so you are able to keep track of your content’s success and manage any needed improvements. The theme also gives you access to the Google Fonts library which contains thousands of font options for you to choose from and add to your site. For those of you looking to build your portfolio on your WordPress site, Mustache also offers two different portfolio gallery options that you can implement. Aesthetic is a responsive WordPress theme built specifically for fashion and lifestyle blogs. The theme includes a minimalist design, the ability to implement a portfolio format with up to four columns, and other customizable features. Aesthetic has a page option ready for donations as well as an option to easily add your own animations to different pages of your website. Exposure is a responsive, photography WordPress theme created for artists looking to display their work with a clean and minimalist design. The theme is ideal for all types of photographers — whether it’s your full-time job or your hobby. For those of you who are looking to sell your photos, the theme is integrated with WooCommerce to keep the shopping and buying processes simple for your customers. There is also a contact form module that you can add to one of your site pages so your visitors can reach out to you with any questions or concerns. Side note: For those of you considering other themes that may not come with a contact form module, HubSpot’s WordPress Contact Form plugin is a tool that you can easily install and add to your own site so your visitors can efficiently get in touch with you. SuperMag is a responsive WordPress theme created for digital magazines. The theme’s magazine-style design features a variety of ways to display photographs, videos, and written content. SuperMag is advertisement-ready so you can easily add your chosen ads to your site pages. There is also an option to enable a “breaking news” page or section for your site if you feel it’s vital for all of your visitors to know about a specific change or event. Fagri is a responsive, multi-purpose WordPress theme built for a wide range of businesses due to its flexible design and large number of customizable features. The theme comes with newsletter integration so you can easily send your email list information about your latest developments, new products, sales, and more. Fagri is SEO-ready so your site is more likely to organically rank on search engines such as Google. Tiny Hestia is a responsive WordPress theme for bloggers. The theme has a minimalist design so your visitors can easily navigate your site and focus on your content. Tiny Hestia is a child theme of Hestia — child themes allow you to modify your current theme to enhance functionality. So, if you are already a Hestia user and want to customize the theme to make it better suited for sharing blog content, you can install Tiny Hestia. When you install a child theme like Tiny Hestia, you don’t lose your ability to update the theme or lose any of your original content. If you’re in the restaurant business and looking for a responsive theme, Bordeaux might be a great option for you. The theme has customizable features fit for restaurants, cafes, and bakeries, and includes a reservation system so you don’t need to find a separate plugin or software to manage your tables. The theme’s homepage has three customizable information blocks including a menu card, items for sale, and latest restaurant news. Today, responsive website themes are a necessity — your WordPress website visitors and customers are browsing your content and purchasing your items on a variety of different devices at all times. That’s why you want to ensure they have a consistent and positive experience on all types of devices. So, try installing a responsive WordPress theme to create a seamless transition for your website visitors no matter the device they’re on — and if the 15 options we’ve described aren’t of interest to you, you can always review the WordPress theme library for more choices tailored to your specific needs. Just remember to review the feature lists to ensure the themes in question include a responsive design.